at least one copolymer comprising at least one hydrophobic unit and at least one unit derived from at least one ethylenically unsaturated monomer comprising at least one sulphonic group, in free or partially or totally neutralized form. The composition may, for example, be used for bleaching human keratin fibers, such as hair. Also disclosed is a process for preparing a ready-to-use composition, comprising mixing, before use, the bleaching composition with the oxidizing composition. This application claims benefit of U.S. Provisional Application No. 60/441,320, filed Jan. 22, 2003 and French Application No. 0300456, filed Jan. 16, 2003. For example, the at least one inert organic liquid can be chosen from polydecenes, carboxylic acid monoesters and polyesters, sugar monoesters and polyesters of C 8-C30 acids, cyclic ethers, cyclic esters, silicone oils, mineral oils and plant oils. For instance, the polydecenes may be chosen from compounds of formula C 10nH[(20n)+2] wherein n is an integer ranging from 3 to 9, such as from 3 to 7. These compounds correspond to the name “polydecene” of the CTFA Dictionary 7th edition 1997, of the Cosmetics, Toiletry and Fragrance Association, USA, and also to the same INCI name in the USA and in Europe. 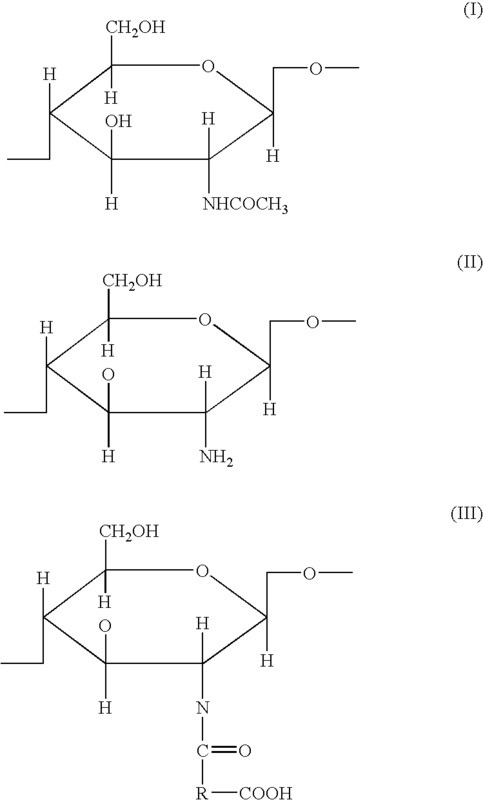 They are poly-1-decene hydrogenation products. As used herein, the carboxylic acid monoesters and polyesters, include: linear and branched, and saturated and unsaturated esters, they may, for example, comprise at least one C 8-C30 hydrocarbon-based chain, further, for example, at least one C8-C24 hydrocarbon-based chain, such as at least one C12-C24 hydrocarbon-based chain, which may be derived from the acid and alcohol portion. The carboxylic acid monoesters and polyesters may also comprise at least one C1-C8 hydrocarbon-based chain and, for example, at least one C1-C6 hydrocarbon-based chain. In one embodiment, if the carboxylic acid comprises several carboxylic functional groups, these functional groups may, for example, all be esterified. It should be noted that the alcohols may, for example, be monofunctional alcohols. In another embodiment, the esters may be chosen from esters obtained from C 12-C24 acids, for example, comprising at least one carboxylic group, and from saturated, linear and branched C3-C6 monoalcohols. With regard to the sugar monoesters and polyesters of C 8-C30 acids, such as C12-C24 acids, it is pointed out that the term “sugar” means compounds comprising several hydroxyl functional groups, with or without an aldehyde or ketone functional groups, and which comprise at least 4 carbon atoms. These sugars may be chosen, for example, from monosaccharides, oligosaccharides and polysaccharides. Non-limiting examples of suitable sugars include sucrose (and saccharose), glucose, galactose, ribose, fucose, maltose, fructose, mannose, arabinose, xylose and lactose, and derivatives thereof, for example, alkyl derivatives, such as methyl derivatives, for instance, methylglucose. Examples of the saturated and unsaturated, linear and branched C 8-C30 acids, comprising one and two carboxylic functional groups, include, as mentioned above, esters of oleic acid, lauric acid, palmitic acid, myristic acid, behenic acid, stearic acid, linoleic acid, linolenic acid, capric acid, and arachidonic acid, and mixtures thereof, such as oleo-palmitic, oleo-stearic, and palmito-stearic, isopropyl diesters of sebacic acid (such as diisopropyl sebacate), dioctyl adipates and dicaprylyl maleates, triethyl citrate, and acids of sugars, such as sucrose (and saccharose), glucose, galactose, ribose, fucose, maltose, fructose, mannose, arabinose, xylose and lactose, and derivatives thereof, for example, alkyl derivatives, such as methyl derivatives, for instance, methylglucose. For example, the at least one amphiphilic polymer may comprise, as at least one hydrophobic chain chosen from, saturated and unsaturated, aromatic and non-aromatic, linear and branched C 8-C30 hydrocarbon-based chains, and optionally comprising at least one oxyalkylene (such as oxyethylene and oxypropylene) unit. (1) celluloses modified with groups comprising at least one hydrocarbon-based chain chosen from saturated and unsaturated, linear and branched C 6-C30 hydrocarbon-based chains, for instance, hydroxyethylcelluloses modified with groups comprising at least one hydrophobic chain as defined previously, such as Natrosol Plus Grade 330 CS(C16 alkyl—sold by the company Aqualon); Bermocoll EHM 100 (sold by the company Berol Nobel), Amercell Polymer HM-1500 (hydroxyethylcellulose modified with a polyethylene glycol (15) nonylphenyl ether group—sold by the company Amerchol). (2) hydroxypropylguars modified with groups comprising at least one hydrophobic chain as defined above, for example Jaguar XC-95/3 (C 1-4 alkyl chain—sold by the company Rhodia Chimie); Esaflor HM 22 (C2-2 alkyl chain—sold by the company Lamberti); RE210-18 (C14 alkyl chain) and RE205-1 (C20 alkyl chain) sold by the company Rhodia Chimie. (4) copolymers of C 1-C6 alkyl (meth)acrylates and of amphiphilic monomers comprising at least one hydrophobic chain. (7) linear (block structure), grafted and starburst polyurethanepolyethers comprising in their chain at least one hydrophilic block, which is generally a polyoxyethylene block which may comprise from 50 to 1 000 oxyethylene units, and at least one hydrophobic block, which may comprise aliphatic groups alone, optionally combined with cycloaliphatic and/or aromatic sequences. For example, the polyurethanepolyethers may comprise at least two C 6-C30 hydrocarbon-based hydrophobic chains, separated by the at least one hydrophilic block; the hydrophobic chains may be pendent chains or chains with at least one of the end groups of the at least one hydrophilic block. In one embodiment, the at least one hydrophobic chain of the anionic amphiphilic polymers may be chosen from saturated and unsaturated, aromatic and non-aromatic, linear and branched C 8-C30 hydrocarbon-based chains. The at least one ethylenically unsaturated monomers bearing at least one hydrophobic side chain may, for example, be chosen from esters of unsaturated carboxylic acids, such as ethacrylic acid, methacrylic acid and acrylic acid, and saturated, linear and branched, C 10-C30 alcohols, such as C12-C22 alcohols. The at least one ethylenically unsaturated monomers bearing at least one hydrophobic side chain may also be chosen from allylic ethers of saturated and unsaturated, aromatic and non-aromatic, branched and unbranched C6-C30 alcohols, which are optionally oxyalkylenated, for example, oxyethylenated, further, for example, from monomers of formula CH2═CR′CH2OBnR wherein R′ is chosen from H and CH3, B is ethylenoxy, n is an integer ranging from 0 to 100, R is a hydrocarbon-based group chosen from alkyl, arylalkyl, aryl, alkylaryl and cycloalkyl groups comprising from 8 to 30 carbon atoms. For example, the unit may be such that R′ is hydrogen, n is equal to 10 and R is a stearyl (C18) group. Anionic amphiphilic polymers of the type described above are described and prepared, for example, in U.S. Pat. Nos. 3,915,921 and 4,509,949 (copolymers of (meth)acrylic acid and of C 10-C30 alkyl (meth)acrylates) or in Patent No. EP 216 479 (copolymers of (meth)acrylic acid and of fatty alkyl allyl ethers). Examples of the amphiphilic polymers of the type described above include Carbopol ETD 2020 (acrylic acid/C 10-C30 alkyl methacrylate crosslinked copolymer—sold by the company Goodrich); Carbopol 1382, Pemulen TR1 and Pemulen TR2 (acrylic acid/C10-C30 alkyl acrylate crosslinked copolymers—sold by the company Goodrich); oxyethylenated methacrylic acid/ethyl acrylate/stearyl methacrylate copolymer (55/35/10); oxyethylenated (25 EO) (meth)acrylic acid/ethyl acrylate/behenyl methacrylate copolymer and methacrylic acid/ethyl acrylate/steareth-10 allyl ether crosslinked copolymer. The at least one water-soluble thickening polymer may, for example, be chosen from polymers of natural origin and synthetic polymers, and, further, for example, be chosen from those conventionally used in cosmetics. In addition, the at least one water-soluble thickening polymer does not contain a hydrophobic chain, i.e. hydrophobic chains chosen from saturated and unsaturated, aromatic and non-aromatic, linear and branched C 8-C30 hydrocarbon-based chains, optionally comprising at least one oxyalkylene (oxyethylene and/or oxypropylene) unit. Non-limiting examples of these polymers include: polyvinylpyrrolidone, polyacrylic acid, polyacrylamide, non-crosslinked poly(2-acrylamidopropanesulphonic acid) (Simugel EG from the company SEPPIC), crosslinked poly(2-acrylamido-2-methylpropanesulphonic acid), free and partially neutralized with ammonia (Hostacerin AMPS from Clariant), mixtures of non-crosslinked poly(2-acrylamido-2-methylpropanesulphonic acid) with hydroxyalkylcellulose ethers and with poly(ethylene oxides), as described in U.S. Pat. No. 4,540,510; mixtures of poly((meth)acrylamido(C 1-C4)alkylsulphonic acid), which may, for example, be crosslinked, with a crosslinked copolymer of maleic anhydride and a (C1-C5)alkyl vinyl ether (Hostacerin AMPS/Stabileze QM from the company ISF). The water-soluble thickening polymers of natural origin may, for example, be chosen from polymers comprising at least one sugar unit, for example, nonionic guar gums, optionally modified with at least one C 1-C6 hydroxyalkyl group; biopolysaccharide gums of microbial origin, such as scleroglucan gum and xanthan gum; gums derived from plant exudates, such as gum arabic, ghatti gum, karaya gum, gum tragacanth, carrageenan gum, agar gum and carob gum; pectins; alginates; starches; hydroxy(C1-C6)alkylcelluloses and carboxy(C1-C6)alkylcelluloses. Non-limiting examples of the anionic surfactants that can be used in the compositions disclosed herein include salts (for example, alkali metal salts, such as sodium salts, ammonium salts, amine salts, amino alcohol salts and magnesium salts) of the following compounds: alkyl sulphates, alkyl ether sulphates, alkylamido ether sulphates, alkylarylpolyether sulphates, monoglyceride sulphates; alkyl sulphonates, alkyl phosphates, alkylamide sulphonates, alkylaryl sulphonates, α-olefin sulphonates, paraffin sulphonates; (C 6-C24)alkyl sulphosuccinates, (C6-C24)alkyl ether sulphosuccinates, (C6-C24)alkylamide sulphosuccinates; (C6-C24)alkyl sulphoacetates; (C6-C24)acyl sarcosinates and (C6-C24)acyl glutamates. It is also possible to use (C6-C24)alkylpolyglycoside carboxylic esters, such as alkylglycoside citrates, alkylglycoside tartrates and alkylglycoside sulphosuccinates, alkylsulphosuccinamates; acyl isethionates and N-acyl taurates, wherein the alkyl and acyl groups of all of these different compounds, for example, comprises from 12 to 20 carbon atoms and the aryl group may, for example, be chosen from phenyl and benzyl groups. Among the anionic surfactants which can also be used, non-limiting mention may be made of fatty acid salts (for example, C6-C24 acid salts), such as oleic, ricinoleic and palmitic acid salts, coconut oil acid and hydrogenated coconut oil acid, and, for example, sodium, calcium and magnesium salts of stearic acid; acyl lactylates wherein the acyl group comprises from 8 to 20 carbon atoms. It is also possible to use alkyl D-galactoside uronic acids and their salts, polyoxyalkylenated (C6-C24)alkyl ether carboxylic acids, polyoxyalkylenated (C6-C24)alkylaryl ether carboxylic acids, polyoxyalkylenated (C6-C24)alkylamido ether carboxylic acids and their salts, for example those comprising from 2 to 50 alkylene oxide groups, such as ethylene oxide groups, and mixtures thereof. Without wishing to be limited thereto, the nonionic surfactants may also be chosen, for example from polyethoxylated and polypropoxylated, alkylphenols, alpha-diols and alcohols, comprising at least one chain comprising, for example, from 6 to 24 carbon atoms, and further, for example, from 8 to 22 carbon atoms, it being possible for the number of ethylene oxide and/or propylene oxide groups to range, for example, from 1 to 50. Further examples also include copolymers of ethylene oxide and of propylene oxide, condensates of ethylene oxide and of propylene oxide with fatty alcohols (for example, C 6-C24); polyethoxylated fatty amides (for example, C6-C24) for example, comprising from 2 to 30 mol of ethylene oxide, monoglycerolated and polyglycerolated fatty alcohols (for example, C6-C24) comprising, for example, from 1 to 30 glycerol groups and polyglycerolated fatty amides (for example, C6-C24) comprising, for example, from 1 to 5 glycerol groups, and, further, for example, from 1.5 to 4, glycerol groups; oxyethylenated fatty acid esters (for example, C6-C24) of sorbitan comprising, for example, from 2 to 30 mol of ethylene oxide; fatty acid esters (for example, C6-C24) of sucrose, fatty acid esters (for example, C6-C24) of polyethylene glycol, alkylpolyglycosides, N-alkylglucamine derivatives, and amine oxides, such as (C10-C14)alkylamine oxides and N-acylaminopropyl-morpholine oxides. For example, the amphoteric or zwitterionic surfactants may chosen from aliphatic secondary and tertiary amine derivatives wherein the aliphatic group is chosen from linear and branched C 8-C18 chains comprising at least one anionic group chosen from carboxylate, sulphonate, sulphate, phosphate and phosphonate groups; (C8-C20)alkylbetaines, (C8-C20)alkylsulphobetaines, (C8-C20)alkylamido(C1-C6)alkylbetaines and (C8-C20)alkylamido(C1-C6)alkylsulphobetaines. Further examples include ampho-carboxyglycinates and ampho-carboxypropionates, classified in the CTFA dictionary, 5th edition, 1993, under the names Disodium Cocoamphodiacetate, Disodium Lauroamphodiacetate, Disodium Caprylamphodiacetate, Disodium Capryloamphodiacetate, Disodium Cocoamphodipropionate, Disodium Lauroamphodipropionate, Disodium Caprylamphodipropionate, Disodium Capryloamphodipropionate, Lauroamphodipropionic acid and Cocoamphodipropionic acid. For example, mention may be made of Cocoamphodiacetate (Miranol® C2M Concentrate from Rhodia Chimie). (7) Polyaminoamide derivatives resulting from the condensation of polyalkylene polyamines with polycarboxylic acids followed by an alkylation with difunctional agents. Examples of these polyaminoamide derivatives include adipic acid-dialkylaminohydroxyalkyldialkylene-triamine polymers wherein the alkyl group is C 1-C4. Such polymers are described, for example, in Patent No. FR 1 583 363. (8) Polymers obtained by reacting a polyalkylene polyamine comprising two primary amine groups and at least one secondary amine group with a dicarboxylic acid chosen from diglycolic acid and saturated C 3-C8 aliphatic dicarboxylic acids, and then with epichlorohydrin. Such polymers are described, for example, in U.S. Pat. Nos. 3,227,615 and 2 961 347.
wherein R, which may be identical or different, is chosen from C 1-C4 alkyl and hydroxyalkyl; n and p, which may be identical or different, are integers ranging from 2 to 20; and X— is an anion chosen from anions derived from mineral and organic acids. wherein p is an integer ranging from 1 to 6, D may be nothing or may represent a group —(CH2) r—CO— wherein r is an integer equal to 4 or 7, and X— is an anion. Such polymers may be prepared according to the processes described in Patent Nos. U.S. Pat. No. 4,157,388, U.S. Pat. No. 4,702,906, U.S. Pat. No. 4,719,282 and EP 122 324. (14) Crosslinked methacryloyloxy(C 1-C4)alkyltri(C1-C4)alkylammonium salt polymers, such as the polymers obtained by homopolymerization of dimethylaminoethyl methacrylate quaternized with methyl chloride, or by copolymerization of acrylamide with dimethylaminoethyl methacrylate quaternized with methyl chloride, the homo- or copolymerization being followed by crosslinking with a compound comprising olefinic unsaturation, for example, methylenebisacrylamide. A crosslinked acrylamide/methacryloyloxyethyltrimethylammonium chloride copolymer (20/80 by weight) in the form of a dispersion comprising 50% by weight of the said copolymer in mineral oil can, for example, be used. This dispersion is sold under the name “Salcare® SC 92” by the company Allied Colloids. A crosslinked methacryloyloxyethyltrimethylammonium chloride homopolymer comprising about 50% by weight of the homopolymer in mineral oil or in a liquid ester can also be used. These dispersions are sold under the names “Salcare® SC 95” and “Salcare® SC 96” by the company Allied Colloids. (2) Polymers comprising units derived from a) at least one monomer chosen from acrylamides and methacrylamides substituted on the nitrogen with an alkyl radical, for example, C 2-C12 (such as ethyl, tert-butyl, tert-octyl, octyl, decyl and dodecyl), b) at least one acidic monomer comprising at least one reactive carboxylic group (for example, acrylic acid, methacrylic acid, crotonic acid and itaconic acid, and monoesters of maleic and fumaric acids and anhydrides), and c) at least one basic monomer, such as esters comprising at least one substituent chosen from primary, secondary, tertiary and quaternary amine substituents of acrylic acid, methacrylic acid, fumaric acid and maleic acid, and products of quaternization of dimethylaminoethyl methacrylate with dimethyl and diethyl sulphate (for example, aminoethyl, butylaminoethyl, N,N′-dimethylaminoethyl and N-tert-butylaminoethyl methacrylates). wherein q is equal to 0 or 1; and if q is equal to 0, then R 1, R2, and R3 which may be identical or different, are chosen from hydrogen, methyl, hydroxyl, acetoxy, amino, monoalkylamino and dialkylamino groups, optionally interrupted with at least one nitrogen and optionally substituted with at least one substituent chosen from amine, hydoxyl and carboxyl groups, alkylthio groups optionally bearing amino groups, and sulphonic groups; or, if q is equal to 1, then R1, R2, and R3, which may be identical or different, are chosen from hydrogen and salts formed by these compounds with acids or bases. wherein R 1 is chosen from hydrogen, CH3O—, CH3CH2O— and phenyl, R2 and R5, which may be identical or different, are chosen from hydrogen and alkyl groups (such as methyl and ethyl), R4 is chosen from alkyl groups (such as methyl and ethyl) and groups of formula —R3—N(R5)2, wherein R3 is chosen from —(CH2)2—, —(CH2)3— and —CH2—CH(CH3)—, and also the higher homologues of these groups and comprising up to 6 carbon atoms, and r is chosen such that the molecular weight of the polymer ranges from 500 to 6 000 000, such as from 1 000 to 1 000 000.
b) polymers of formula -D-X-D-X- wherein D is —N[CH 2CH2]2N-(piperazinyl) and X is chosen from symbols E and E′ and at least once is chosen from E′; wherein E has the meaning defined above and E′ is chosen from divalent alkylene groups comprising at least one chain chosen from straight and branched chains comprising up to 7 carbon atoms in the main chain, wherein the divalent alkylene groups are optionally substituted with at least one hydroxyl group and comprising at least one nitrogen, wherein the nitrogen atom is substituted with an alkyl chain, which is optionally interrupted by an oxygen atom and wherein the divalent aklylene groups comprise at least one functional group chosen from carboxyl and hydroxyl functional groups and wherein the alkyl chain can be betainized by reaction with chloroacetic acid or sodium chloroacetate. (9) (C 1-C5)alkyl vinyl ether/maleic anhydride copolymers partially modified by semiamidation with an N,N-dialkylaminoalkylamine, such as N,N-dimethylamino-propylamine or by semiesterification with an N,N-dialkanolamine. These copolymers can further comprise other vinyl comonomers, such as vinylcaprolactam. Further, for example, at least one nonionic surfactant may be chosen from polyethoxylated and polypropoxylated fatty alcohols (such as C 6-C24 alcohols), the number of ethylene oxide and/or propylene oxide groups may range, for example, from 1 to 50 groups; mono- and polyglycerolated fatty alcohols (such as C6-C24 alcohols) comprising, for example, from 1 to 30 glycerol groups, and polyglycerolated fatty amides (such as C6-C24 amides) comprising, for example, from 1 to 5 glycerol groups and, further, for example, from 1.5 to 4 glycerol groups. The ethylenically unsaturated monomers comprising at least one sulphonic group can be chosen, for example, from vinylsulphonic acid, styrenesulphonic acid, (meth)acrylamido(C 1-C22)alkylsulphonic acids, and N-(C1-C22)alkyl(meth)acrylamido(C1-C22)alkylsulphonic acids, for instance, undecylacrylamidomethanesulphonic acid, and also partially or totally neutralized forms thereof. (Meth)acrylamido(C 1-C22)alkylsulphonic acids, such as acrylamidomethanesulphonic acid, acrylamidoethanesulphonic acid, acrylamidopropanesulphonic acid, 2-acrylamido-2-methylpropanesulphonic acid, methacrylamido-2-methylpropanesulphonic acid, 2-acrylamido-n-butanesulphonic acid, 2-acrylamido-2,4,4-trimethylpentanesulphonic acid, 2-methacrylamidododecylsulphonic acid and 2-acrylamido-2,6-dimethyl-3-heptanesulphonic acid, and also partially or totally neutralized forms thereof, can, for example, be used. For example, 2-acrylamido-2-methylpropanesulphonic acid (AMPS) and partially or totally neutralized forms thereof can be used. The copolymers, as disclosed herein, may be chosen, for example, from random amphiphilic AMPS polymers modified by reaction with at least one C 6-C22 n-monoalkylamine and di-n-alkylamine, such as those described in Patent Application No. WO 00/31154, the description of the polymers and of the synthesis of which forms part of the content of the description. 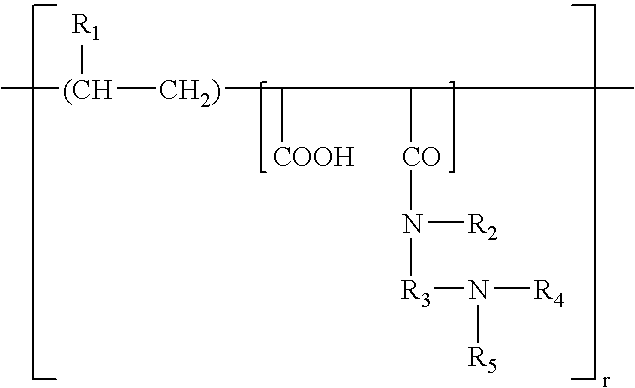 wherein R 1 and R3, which may be identical or different, are chosen from hydrogen and linear and branched C1-C6 alkyl groups (such as methyl); Y is chosen from O and NH; R2 is chosen from hydrophobic hydrocarbon-based groups comprising from 6 to 50 carbon atoms, for example, from 6 to 22 carbon atoms, further, for example, from 6 to 18 carbon atoms, and even further, for example, from 12 to 18 carbon atoms; x is an integer ranging from 0 to 100. For example, R 2 is chosen from linear C6-C18 alkyl groups (for example, n-hexyl, n-octyl, n-decyl, n-hexadecyl and n-dodecyl) and branched and cyclic C6-C18 alkyl groups (for example, cyclododecane (C12) and adamantane (C10)); C6-C18 alkylperfluoro groups (for example, groups of formula —(CH2)2—(CF2)9—CF3); cholesteryl groups (C27) and cholesterol ester residues, for instance, cholesteryl oxyhexanoate groups; aromatic polycyclic groups, for instance, naphthalene and pyrene. Among these groups, R2 can be chosen, for example, from linear alkyl groups and n-dodecyl groups. wherein x is an integer ranging from 3 to 100, for example, from 5 to 80, such as from 7 to 25; R 1 is chosen from hydrogen and linear and branched C1-C6 alkyl groups (such as methyl) and R4 is chosen from linear and branched C6-C22 hydrocarbon-based chains, such as C10-C22 alkyls. Even further examples include copolymers wherein x=25, R 1 is methyl and R4 is n-dodecyl; which are described in the Morishima articles mentioned above. In one embodiment the amphiphilic copolymers, as disclosed herein, may be obtained according to the standard free-radical polymerization processes in the presence of at least one initiator, such as azobisisobutyronitrile (AIBN), azobisdimethylvaleronitrile, ABAH (2,2-azobis[2-amidinopropane]hydrochloride), organic peroxides, such as dilauryl peroxide, benzoyl peroxide, and tert-butyl hydroperoxide, mineral peroxide compounds, such as potassium persulphate and ammonium persulphate, and H 2O2 optionally in the presence of reducing agents. According to the above process, 2-acrylamido-2-methylpropanesulphonic acid and sodium and ammonium salts thereof can, for example, be polymerized with at least one (meth)acrylic acid ester and C 10-C18 alcohol oxyethylenated with 8 mol of ethylene oxide (8 EO) (Genapol® C-080 from the company Hoechst/Clariant), C11 oxo alcohol oxyethylenated with 8 mol of ethylene oxide (Genapole UD-080 from the company Hoechst/Clariant), C11 oxo alcohol oxyethylenated with 7 mol of ethylene oxide (Genapole UD-070 from the company Hoechst/Clariant), C12-C14 alcohol oxyethylenated with 7 mol of ethylene oxide (Genapole LA-070 from the company Hoechst/Clariant), C12-C14 alcohol oxyethylenated with 9 mol of ethylene oxide (Genapol® LA-090 from the company Hoechst/Clariant), C12-C14 alcohol oxyethylenated with 11 mol of ethylene oxide (Genapol® LA-110 from the company Hoechst/Clariant), C16-C18 alcohol oxyethylenated with 8 mol of ethylene oxide (Genapol® T-080 from the company Hoechst/Clariant), C16-C18 alcohol oxyethylenated with 15 mol of ethylene oxide (Genapol® T-150 from the company Hoechst/Clariant), C16-C18 alcohol oxyethylenated with 11 mol of ethylene oxide (Genapole T-110 from the company Hoechst/Clariant), C16-C18 alcohol oxyethylenated with 20 mol of ethylene oxide (Genapol® T-200 from the company Hoechst/Clariant), C16-C18 alcohol oxyethylenated with 25 mol of ethylene oxide (Genapol® T-250 from the company Hoechst/Clariant), C18-C22 alcohol oxyethylenated with 25 mol of ethylene oxide and C16-C18 iso alcohol oxyethylenated with 25 mol of ethylene oxide. As used herein, the term “fatty alcohol” means any saturated or unsaturated, linear or branched fatty alcohol. Among these fatty alcohols, C 12-C22 alcohols may, for example, be used. Non-limiting examples of the present invention will now be given. 2. The composition according to claim 1, wherein the composition is for bleaching human keratin fibers. 3. The composition according to claim 2, wherein the human keratin fibers are hair. 4. The composition, according to claim 2, wherein the composition is obtained by mixing before using it. 5. The composition according to claim 1, wherein the at least one anhydrous bleaching composition is in paste form. 6. The composition according to claim 1, wherein the at least one oxidizing composition is in the form of a hydrogen peroxide oil-in-water emulsion. 7. The composition according to claim 1, wherein the at least one inert organic liquid is chosen from polydecenes, carboxylic acid monoesters, carboxylic acid polyesters, sugar monoesters of C8-C30 acids, polyesters of C8-C30 acids, cyclic ethers, cyclic esters, silicone oils, mineral oils and plant oils. 8. The composition according to claim 1, wherein the at least one inert organic liquid is chosen from C8-C30 acid esters chosen from saturated, linear and branched C3-C6 monoalcohols. 9. The composition according to claim 1, wherein the at least one peroxygenated salt is chosen from alkali metal persulphates, alkaline-earth metals persulphates, perborates, percarbonates and peroxides. 10. The composition according to claim 9, wherein the at least one peroxygenated salt is chosen from sodium persulphates and potassium persulphates. 11. The composition according to claim 1, wherein the at least one peroxygenated salt is present in the at least one anhydrous bleaching composition in an amount ranging from 10% to 70% by weight, relative to the total weight of the at least anhydrous bleaching composition. 12. The composition according to claim 11, wherein the at least one peroxygenated salt is present in the at least one anhydrous bleaching composition in an amount ranging from 20% to 60% by weight, relative to the total weight of the at least one anhydrous bleaching composition. 13. The composition according to claim 1, wherein the at least one peroxygenated salt is present in an amount ranging from 5% to 35% by weight, relative to the total weight of the composition. 14. The composition according to claim 13, wherein the at least one peroxygenated salt is present in an amount ranging from 10% to 30% by weight, relative to the total weight of the composition. 15. The composition according to claim 1, wherein the at least one alkaline agent is chosen from urea; ammonium salts; alkali metal silicates, alkaline-earth metal silicates, phosphates and carbonates. 16. The composition according to claim 1, wherein the at least one alkaline agent is present in the at least one anhydrous bleaching composition in an amount ranging from 0.01% to 40% by weight, relative to the total weight of the at least one anhydrous bleaching composition. 17. The composition according to claim 16, wherein the at least one alkaline agent is present in the at least one anhydrous bleaching composition in an amount ranging from 0.1% to 30% by weight, relative to the total weight of the at least one anhydrous bleaching composition. 19. The composition according to claim 18, wherein the at least one alkaline agent is present in an amount ranging from 0.05% to 15% by weight, relative to the total weight of the composition. 20. The composition according to claim 1, wherein the at least one anhydrous bleaching composition further comprises at least one surfactant chosen from nonionic, anionic, amphoteric, zwitterionic and cationic surfactants. 21. The composition according to claim 1, wherein the at least one anhydrous bleaching composition further comprises at least one water-soluble thickener not comprising a hydrophobic chain. 22. The composition according to claim 21, wherein the at least one water-soluble thickener in the at least one anhydrous bleaching composition is present in an amount ranging from 0.01% to 30% by weight, relative to the total weight of the at least one anhydrous bleaching composition. 23. The composition according to claim 1, wherein the at least one anhydrous bleaching composition further comprises at least one amphiphilic polymer comprising at least one hydrophobic chain. 24. The composition according to claim 23, wherein the at least one amphiphilic polymer is different from the at least one copolymer present in the at least one oxidizing composition. 25. The composition according to claim 23, wherein the at least one amphiphilic polymer comprising at least one hydrophobic chain is present in an amount ranging from 0.01% to 30% by weight, relative to the total weight of the composition. 26. The composition according to claim 1, wherein the at least one anhydrous bleaching composition comprises less than 1% by weight of water, relative to the total weight of the at least one anhydrous bleaching composition. 27. The composition according to claim 26, wherein the at least one anhydrous bleaching composition comprises less than 0.5% by weight of water, relative to the total weight of the at least one anhydrous bleaching composition. 28. The composition according to claim 1, wherein the at least one copolymer of the oxidizing composition comprises at least one unit derived from at least one ethylenically unsaturated monomer comprising at least one sulphonic group chosen from vinylsulphonic, styrenesulphonic, (meth)acrylamido(C1-C22)alkylsulphonic, and N-(C1-C22)alkyl(meth)acrylamido(C1-C22)alkylsulphonic acids. 29. The composition according to claim 28, wherein the N-(C1-C22)alkyl(meth)acrylamido(C1-C22)alkylsulphonic acid is chosen from undecylacrylamidomethanesulphonic acid. 30. The composition according to claim 1, wherein the at at least one hydrophobic unit, of the at least one copolymer, comprises from 6 to 50 carbon atoms. 31. The composition according to claim 30, wherein the at least one hydrophobic unit, of the at least one copolymer, comprises from 6 to 22 carbon atoms. 32. The composition according to claim 31, wherein the at least one hydrophobic unit, of the at least one copolymer, comprises from 6 to 18 carbon atoms. 33. The composition according to claim 32, wherein the at least one hydrophobic unit, of the at least one copolymer, comprises from 12 to 18 carbon atoms. 34. The composition according to claim 1, wherein the at least one copolymer is present in an amount ranging from 0.005% to 15% by weight, relative to the total weight of the composition. 35. The composition according to claim 34, wherein the at least one copolymer is present in an amount ranging from 0.05% to 7.5% by weight, relative to the total weight of the composition. 36. The composition according to claim 35, wherein the at least one copolymer is present in an amount ranging from 0.1% to 5% by weight, relative to the total weight of the composition. at least one nonionic surfactant chosen from polyethoxylated and polypropoxylated, alkylphenols, alpha-diols and alcohols comprising at least one fatty chain, copolymers of ethylene oxide and of propylene oxide, condensates of ethylene oxide and of propylene oxide with fatty alcohols, polyethoxylated fatty amides, mono- and polyglycerolated fatty alcohols, polyglycerolated fatty amides, oxyethylenated fatty acid esters of sorbitan, fatty acid esters of sucrose, fatty acid esters of polyethylene glycol, alkylpolyglycosides, N-alkylglucamine derivatives, and amine oxides. 38. The composition according to claim 37, wherein the at least one fatty chain of the alcohol comprising at least one fatty chain, comprises from 6 to 24 carbon atoms. 39. The composition according to claim 37, wherein the amine oxides are chosen from (C10-C14)alkylamine oxides and N-acylaminopropylmorpholine oxides. 40. The composition according to claim 20, wherein the at least one surfactant is present in an amount ranging from 0.05% to 30% by weight, relative to the total weight of the composition. 41. The composition according to claim 40, wherein the at least one surfactant is present in an amount ranging from 0.1% to 20% by weight, relative to the total weight of the composition. 42. The composition according to claim 6, wherein the oil phase of the oil-in-water emulsion comprises at least one fatty alcohol. 43. The composition according to claim 6, wherein the hydrogen peroxide in the composition is present in an amount ranging from 1% to 12% as hydrogen peroxide titre. 44. The composition according to claim 43, wherein the hydrogen peroxide in the composition is present in an amount ranging from 2% to 9% as hydrogen peroxide titre. 45. The composition according to claim 44, wherein the hydrogen peroxide in the composition is present in an amount ranging from 2% to 6% as hydrogen peroxide titre. 46. The composition according to claim 1, wherein the pH of the oil-in-water emulsion ranges from 1 to 6. 47. The composition according to claim 46, wherein the pH of the oil-in-water emulsion ranges from 2 to 4. 48. The composition according to claim 1, wherein the pH of the composition ranges from 4 to 12. 49. The composition according to claim 48, wherein the pH of the composition ranges from 7 to 11.5. 50. The composition according to claim 49, wherein the pH of the composition ranges from 8 to 11. 52. The process according to claim 51, wherein the human keratin fibers are hair. 53. The process, according to claim 51, wherein the process is obtained by mixing before using it. 54. The process according to claim 51, wherein the at least one anhydrous bleaching composition is in paste form. 55. The process according to claim 51, wherein the at least one oxidizing composition is in the form of a hydrogen peroxide oil-in-water emulsion. 57. The process according to claim 56, wherein the human keratin fibers are hair. 58. The process according to claim 56, wherein the at least one anhydrous bleaching composition is in paste form. 59. The process according to claim 56, wherein the at least one oxidizing composition is in the form of a hydrogen peroxide oil-in-water emulsion. 60. The process according to claim 56, wherein the leave-in time ranges from 1 to 60 minutes. 61. The process according to claim 60, wherein the leave-in time ranges from 10 to 50 minutes. 63. The composition according to claim 62, wherein the at least one anhydrous bleaching composition is in paste form. 64. The composition according to claim 62, wherein the at least one oxidizing composition is in the form of a hydrogen peroxide oil-in-water emulsion. ES2254626T3 (en) 2006-06-16 Reshapable hair styling composition comprising copolymers (meth) acrylic.